Mabou, Cape Breton taken 1937 by Jack McCully of Fad Foto. First Catholic church cemetery estabished 1833. There are approx. 144 graves here, many marked by a stone (rock) without names, set on a cement block base. 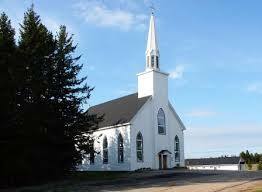 The cemetery overlooks Mabou Harbour and is almost across the water from the present day Catholic church & cemetery. South of Mabou on Rte. 19, take a left onto Rankinville Road to The Old Pioneer Cemetery. It contains the graves of the earliest settlers, including that of Benjamin Worth, a Loyalist from New Jersey who was the town's first settler. The Mother of Sorrows Pioneer Shrine was built in the 1920s as a memorial to the pioneers buried at the cemetery. 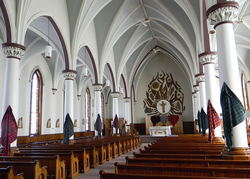 It's a beautiful small version of the typical Cape Breton church, but the interior is remarkable, the walls and ceiling of natural tongue-and-groove Douglas fir. 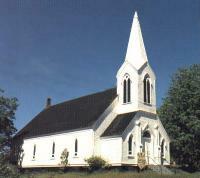 Saturday Evenings - 4pm (late fall & winter) 7pm (spring, summer and early fall) Sundays @ 10am, Officiant Father Angus Morris for more information please call 902-945-2952. St. Joseph Renewal Centre welcomes people from all walks of life individuals walking a spiritual path founded in the tradition of their choice, church or other groups providing “time away” for their members. Our location in Mabou, Cape Breton will provide the peace and quiet you need to relax, recharge and reconnect. For more information regarding retreats, registration and spiritual direction visit their website below or telephone. 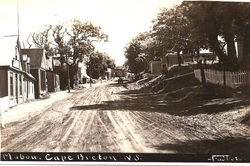 Jim St. Clair can be heard every Wednesday Morning on CBC radio one at 8:20am, highlighting little known or often overlooked stories from Cape Breton's past, celebrating the islands' people and places. Jim continues his Inverness Country family and regional tradition of storytelling. Jim is the author of Nancy's Wedding Feast and other tasty Tales, and a broadcaster at CBC as well as the subject of StorySave's 2008 three-CD set release. 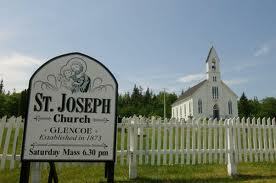 St.Clair is a driving force behind Roots Cape Breton. He is a collector of local history, which he began doing at a very young age and helped to create the genealogical and archival collection presently at the Highland Village.